There are so many things that conjure my loved ones and I hold onto those with much love and sentiment. 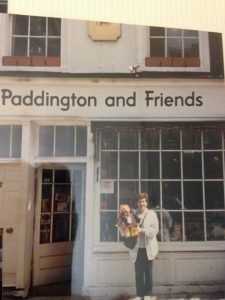 There is the Les Miserables sweatshirt my mom looked so cute in, along with her Paddington Bears and toy cars. 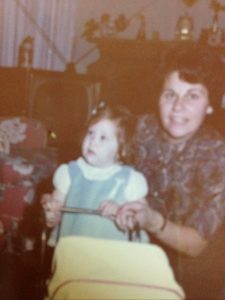 I feel especially connected to my grandma when I use the rolling pins and cookie cutters that I used with her from the time I was a little girl. I hold dear the movie history book that my dad kept and updated with the death dates for the actors as they occurred. He was never interested in celebrities, so this always struck me as so odd but as endearingly funny and quirky as my dad. I love to look at his USMC cap and model of the F7 airplane he flew during the Korean War, as well as some of his books, including the book of dog breeds that we used to study when I was a girl. In my living room stands the curio cabinet that my great-uncle Davis made and my Tanta Rosie gave to me because I’d admired it since I was a young girl. Those are just some of the love-filled mementos I have of the past. 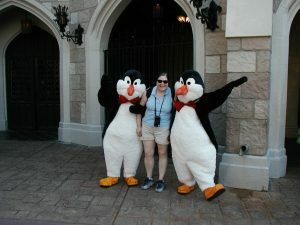 If you’ve been reading this blog, you also know that Ben and I loved to look at photos to revisit our days in Walt Disney World. 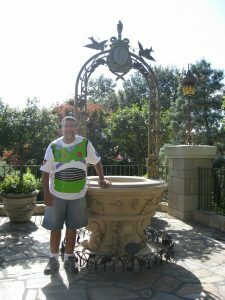 I found web sites on which I could upload favorite photos and make a quilt, shower curtain and towel, so that he could always be surrounded by his favorite pictures and memories. 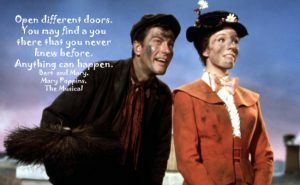 Now, those wonderful, magical times surround me. Ben also had a huge and ever-growing collection of t-shirts, many of which I brought for him as little surprises. I could not part with them. I couldn’t keep that many t-shirts and wear them. I had them made into quilts for Ben’s daughter and for me. 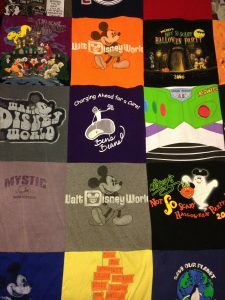 When I set mine out on the bed, it was emotional to think of what the t-shirts represented- the many Mickey’s Not-So-Scary Halloween Parties, places we visited, events we attended, and things he loved, like the Beatles. Now, it is a special feeling to wrap myself in those memories. For a while after he was gone, I continued to order t-shirts that I knew he would have loved. I’ve tried to curtail that, because without him here, they don’t bring the same joy, and I would soon need to make a new quilt! The things that bring an unexpected sentimentality are the things that become most unnerving. Recently, it was Ben’s table, which was also his desk. He brought it with him when he moved into my apartment. 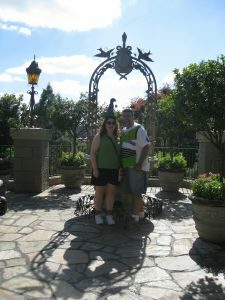 I never liked it, and I tried to persuade him to let us get a new one. It was a somewhat beaten up, not terribly steady, unattractive folding table. He knew it was always on the verge of collapsing, but, it was comfortable for him and since he dealt so graciously with all of my dolls, how could I really argue? This is Ben’s table waiting to be filled with cookie batter and lots of supplies! 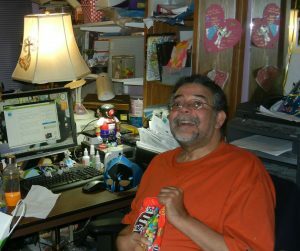 Several months after he passed, I began to fix and redecorate the apartment. 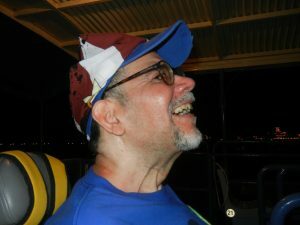 It felt too soon, but my tiny NYC apartment held many physical and emotional scars of ALS. 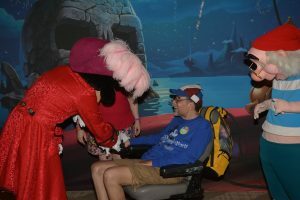 I knew that it was a positive thing to do, but it also came with the guilt that making the changes, albeit necessary, might even slightly imply that I was happy he was not here and I could change things. I also wished that he could be here to enjoy it. I painted, recarpeted and got some new furniture. I also put up many pictures of Ben, continued to display his things and even framed one of his Beatles albums. He was a part of each decorating decision that I made and he remains very present here. I thought it would be good to get a new table. I found a nice wood dining table that could be extended and I liked that idea because my intention was to start inviting people over. That was something we did not do when Ben was ill because he was self-conscious about having people see him and because the apartment was, frankly, a very cluttered disaster. Given how much I disliked the table, I thought it would be easy to replace it. But, like the computer that sat on that table, it was like a lifeline to Ben. He sat at the table almost every day. I brought him to the table in the morning before I left for work, and brought him back to bed from the table each night. His little collection of Disney toys was on that table. He played around on the computer all day at that table. I fed him his meals at that table. I set his shaving things on that table as he taught me how to shave him (I can’t say I ever mastered it very well but Ben said I did pretty well). 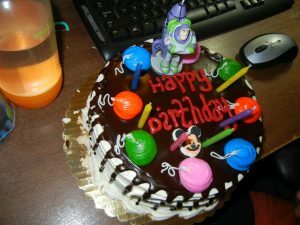 His birthday cakes and parties took place around that table. He looked at our Christmas tree from that table, and as I explained in a prior post, I placed his favorite ornaments on our tree so that he could see them from his chair at his table. Sometimes, after I put him to bed, I would decorate the table or place surprises for him that he would spot when he sat at the table. 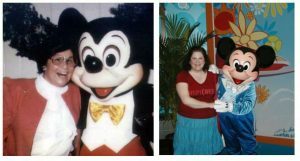 For example, one Halloween, I got him a Disney countdown calendar figurine and every morning, when he settled in at the table, he would see that I had moved the day closer to Halloween. The night before Halloween I put Halloween garlands and fake cobwebs all over his desk area. I also waited for him to go to bed to sit at the table and make my crafts, including making elaborate cards and gifts for him. He knew there would be surprises and he loved to discover them. Ben’s birthday, 2013, seated at his table. He loved peanut butter M&Ms but shortly after that photo was taken, he had to stop eating them. Birthday cake, 2013, on his table. There was a lot of history in that ugly table! I simply could not get rid of it. I decided to keep it, and to use it when I baked cookies and humentashen. I knew Ben would approve of that, because he loved when I baked and he even helped with the humentashen until ALS took the use of his hands. I folded the table and kept it behind my media cabinet. I placed his computer right on my new table and I continue to use it to play his music. I could never part with his computer. 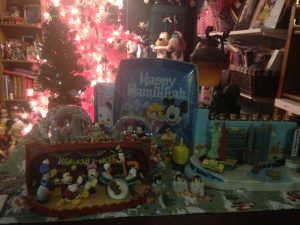 This Christmas, I put his fiber optic Disney tree in the same corner of the new table that he liked it to be on his table. Holiday display on the new table, with Ben’s little Disney fiber optic tree in the same position that it had on his table. 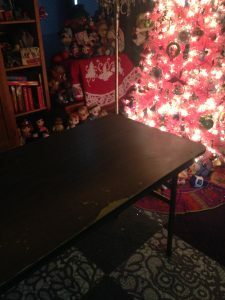 On Christmas Eve, I took out Ben’s table to do my baking. Baking Christmas cookies gives me a lot of peace and I looked forward to doing this. As I started to set up the table, one of the legs broke off. I was devastated. In a panic, I got out my drill and tried to fix it. I took out my heavy duty glues, too. Nothing worked. I managed to secure the leg so that I could use the table anyway and just hoped that it would not collapse. I asked Ben’s friend to come over and look at the table. He did not seem too hopeful that it could be fixed but he could tell that I was heartbroken and said he could try to drill new holes. I was able to complete all of my baking and decorating, which was quite a relief. Ben would be delighted with these finished products. 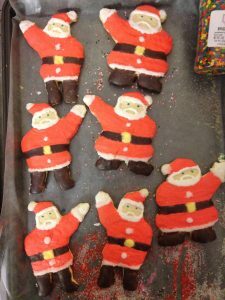 The last batch of Santa cookies made and decorated on Ben’s table. 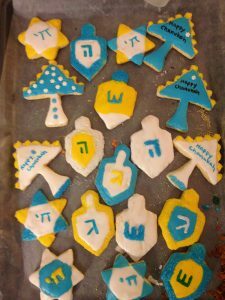 Chanukah cookies made on Ben’s table. 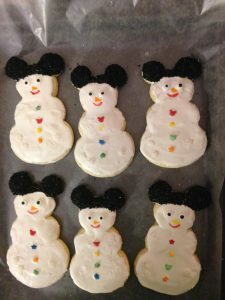 Mickey Mouse snowmen cookies. Also, the last ones made on Ben’s table. 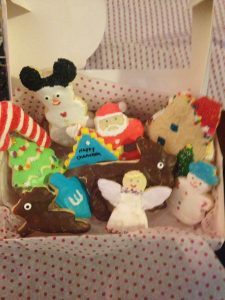 The final assortment of cookies! My grandma and Ben would be proud! On Wednesday, as I went to fold the table, the opposite leg broke off. I was utterly crushed. I realized that there was no way that the table could be repaired. Ben would not have been surprised. 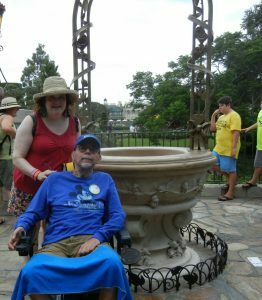 He knew the table was not in good shape but I think that, especially as the ALS progressed, he knew what was comfortable and manageable for him. I cried as I kept some of the nails and hardware and took the table outside to the curb. This eyesore of a table that I’d wanted to replace was the hardest thing to let go. 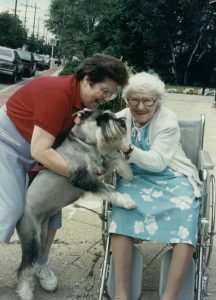 In caregiving and in grief, we are reminded to focus on memories that keep us connected to our loved ones and let us remember them as they were and as we were together. 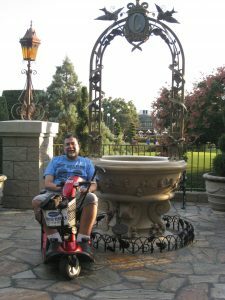 I’ve written about the wonderful memories that comfort me in the difficult times and memories of the ugliness of ALS. I am eternally grateful for the times that I could make my dad and Ben smile, or make their lives a little easier and more comfortable. Those moments are priceless reminders of the depth of the love we shared. The heirlooms and treasured objects also hold memories and affection. Then, there are the surprising things-the “stuff”- like Ben’s table, that touch my heart with the stories they tell. 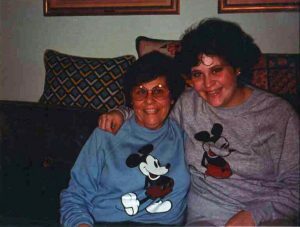 In love and loss, and caregiving and grief, all of these things matter.